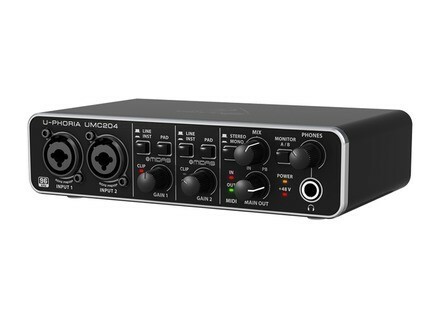 U-Phoria UMC204, USB audio interface from Behringer in the U-Phoria series. Behringer introduces at NAMM 2013 four U-PHORIA USB audio interfaces equipped with Midas Xenyx mic preamps. The UMC202 (2 x 2) and UMC204 (2 x 4) employ 24-Bit/96 kHz digital converters. Both models include dual mic/line/instrument inputs and an array of controls demanded in professional applications. The UMC22 and UM2 offer a single mic input and one instrument input and are ideally suited to recording on the go with a laptop. 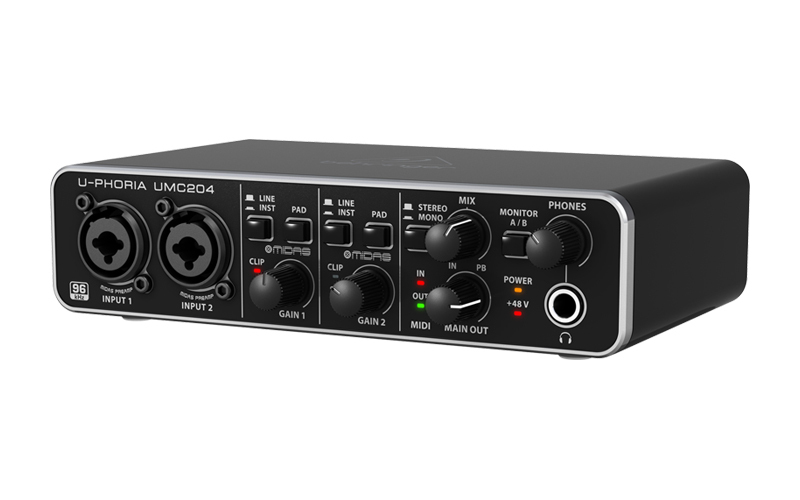 All units feature high-speed USB 2.0 interfaces, +48 V Phantom Power for use with condenser microphones, phones output with Level control and Direct Monitor select, Status, Signal and Clip LEDs and an aluminium chassis. They are compatible with many popular software packages including Avid Pro Tools, Ableton Live, Steinberg Cubase, and others on Mac OS X and Windows. Behringer is also offering a massive recording, editing and podcasting software bundle as a free download, with virtual instruments and effects plug-ins included in the bundle. Pricing and availability are to be announced. [NAMM] AIR Vacuum Pro and Loop virtual synths AIR, the creator of the Ignite music creation software for the M-Audio keyboard controllers, launches two new virtual synthesizers at NAMM 2013. [NAMM] 2 Alesis Hub interfaces for iOS and USB Alesis introduces at NAMM 2013 the Control Hub MIDI Interface and iO Hub audio interface for both iOS and Mac & PC. Audiffex launch the Guitar Line Series Audiffex Guitar Line Series simulate guitar gear, wether effects or speakers. The first product of the line is the Multi Drive Pedal plug-in.